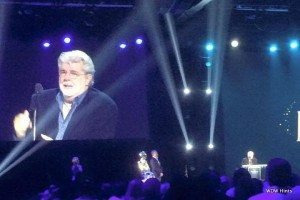 On day 1 of the 2015 D23 Expo, the Disney Legends Awards kicked off the celebration of Disney fandom with surprise musical guests, celebrity appearances, and tributes to some of the Disney greats. Hosted by the ever-so-wonderful Bob Iger, the event started with a tribute to all of the past Disney Legends–animators, imagineers, musicians, etc. After honoring these Disney heroes, none other than Richard Sherman did a duet performance with Ashley Brown, who played Mary Poppins on Broadway. Many new Disney Legends were inducted, including Julie Reihm Casaletto, the first ambassador of Disneyland. In addition, George Bodenheimer (of ESPN fame), Eyvind Earle, And Andreas Deja were honored. 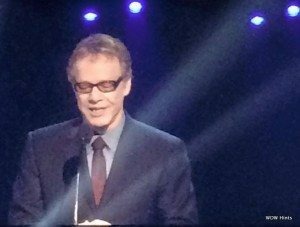 In true Disney style, Iger saved the most exciting awards for last, finishing out the panel by awarding none other than Danny Elfman, followed by GEORGE LUCAS. Yes, that’s right, GEORGE. LUCAS. As if all of these wonderful appearances were not enough, we were also treated to surprise musical performances by James Monroe Iglehart (Broadway), Josh Strickland (Broadway), and Ne-Yo (general musical fame). Iglehart did a spellbinding rendition of Oogie Boogie’s Song to introduce Danny Elfman, and Strickland did a moving cover of Phil Collins’s “You’ll Be in My Heart” in honor of the Disney Legends who have passed away. Keeping in the same spirit, Ne-Yo sang “Friend Like Me” in honor of Robin Williams, just a couple days after the one year anniversary of his passing. And, because this is D23, a huge panel like this would not have been complete without one last surprise… Which happened to be the presence of Johnny Depp, who was also awarded the great honor of becoming a Disney Legend. 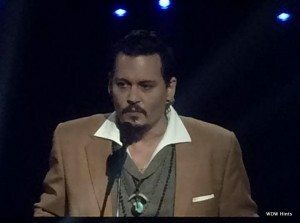 When addressing the audience, Depp told Disney fans that he didn’t want to address them as fans, because he felt that it implied unnecessary hierarchy. While searching for a proper word, an audience member shouted “PARLET!” which Depp then repeated in his famous Jack Sparrow voice, evoking ridiculous amounts of cheering and laughter from those in the audience. In true Disney style, Bob Iger put on a spectacle for the newly inducted Disney Legends. Congratulations to all of you; you deserve it! Previous PostDisney Animation Studios & Pixar: What's Next? Next Post#ShareYourLegacy Sweepstakes!